The Linux kernel is improving faster than ever, gaining 7.8 patches per hour and 4,600 lines of new code every day. That's according to a new report published Monday by the Linux Foundation and focusing on the state of kernel development. Entitled “Linux kernel development -- how fast it is going, who is doing it, what they are doing, and who is sponsoring it,” the report is the seventh the nonprofit has published on the topic in roughly as many years. This year’s paper covers work completed through Linux kernel 4.7, with an emphasis on releases 3.19 to 4.7. The last report was released March 2015 and focused on versions 3.11 to 3.18. Among the findings this year is that more than 13,500 developers from more than 1,300 companies have contributed to the Linux kernel since the adoption of Git made detailed tracking possible back in 2005. Just since the last report, nearly 5,000 developers from 400 companies have contributed to the kernel, and almost half of them were doing so for the first time. Things are clearly getting faster, too. This year's rate of 7.8 changes accepted into the kernel per hour on average is up from 7.71 in the last report. A new kernel comes out every nine to 10 weeks. Intel, Red Hat, Linaro, Samsung, SUSE, IBM, Renesas, Google, AMD, Texas Instruments, and ARM were among the top organizational sponsors of Linux kernel development in this analysis. The Outreachy program -- which provides open source internships to underrepresented groups -- ranked at No. 13. On the whole, however, the volume of contributions from unpaid developers fell from 11.8 percent in 2014 to just 7.7 percent in this report. The Linux kernel was launched 25 years ago this Thursday. It now includes 22 million lines of code. "The Linux kernel continues to be one of the most visible and prolific examples of open source software development," said Stephen Hendrick, a principal analyst at Enterprise Strategy Group. The growing proportion of work being done by paid developers "demonstrates the strategic importance of Linux to the IT vendor community that largely drives its development," Hendrick said. 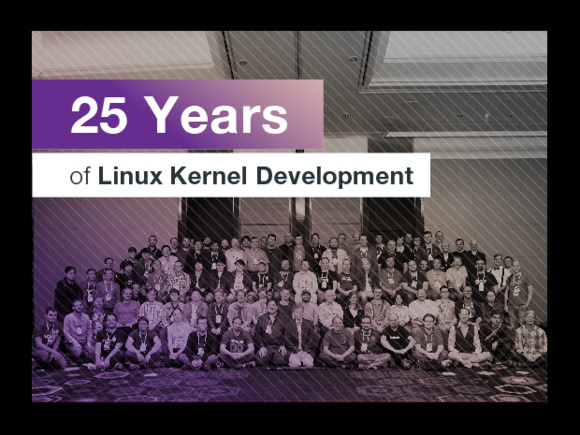 The fact that the Linux kernel is now celebrating its 25th anniversary, meanwhile, is a testament to the project’s ability to embrace change, he added. "This change has made it easier for developers to participate and provides a more streamlined and efficient method to leverage contributions," Hendrick said. "Overall, there are lessons to be learned here on how to consistently keep important technologies relevant."